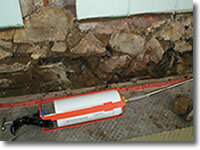 Rising Damp is the action of water moving vertically through porous material in contact with the ground. This is brought about by the drying action of air on upper surfaces, which causes the wall to act like a wick. Penetrating Damp is a term applied to moisture, which travels horizontally from a source bridging the installed damp course such as high external ground level or earth retaining walls below ground level.